The draw to making a living selling real estate is obvious. The potential profits that can be made from simply overseeing a purchase are very lucrative. The dirty truth is that 80% of all deals are closed by only 20% of the realtors out there. The competition can be fierce, that's why it is so important to keep a steady flow of real estate leads. This can only be accomplished by having a variety of sources for leads. That way, even when you get a rough patch or slowdown in home purchases, you'll be able to keep momentum. If you're thinking about becoming a realtor or already are one, check out these eight ways you can increase your realtor leads. This is often overlooked source for real estate leads. 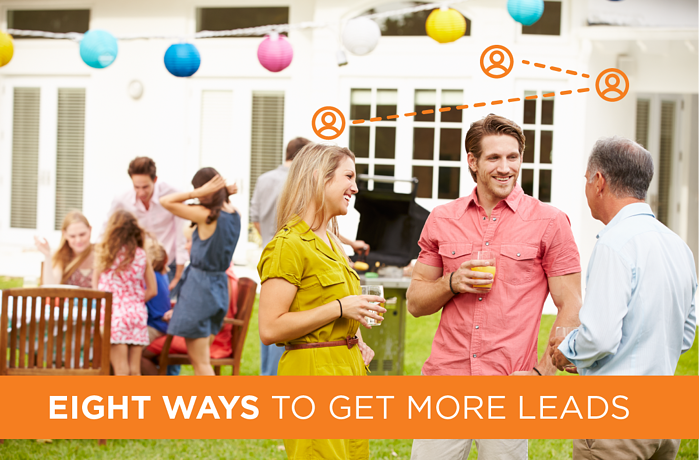 After closing a deal, you should follow-up later and help them throw a great housewarming party. You get to treat yourself and you get to do a little prospecting at the same time. Many realtors find that its a lot easier to connect with leads in person. So if that sounds like you, this is the perfect opportunity to find neighbors, friends, and family who like your work. Convincing cold leads to sell is difficult over the phone or online, but in the setting of your recent sale: this is your time to shine! A realtor should always denote a portion of their marketing budget towards paid ads online. This includes Google, Zillow, and Facebook. Pay-per-click ads are contextual, so you can control who they target and how much you can afford to run them. PPC ads shouldn't be confused with pay-per-lead. These ads are not the same investment, you can't control where they end up or when they appear. This means they are utterly useless for real estate lead generation. Online ads are great, as nearly half of all buyers do some level of research online before finding their home. Facebook, in particular, can be very helpful as a realtor, as they show you trends and analytics of your ads. There's no reason why you should have a website to generate leads for your business. Even if you already have a page on your broker's site, you need to have your own branding. People want authenticity, so the only way to honestly convey your brand is through personal posts. Here you can advertise testimonials, your track record, and strengths as a realtor. This is something you should start building as soon as possible and add on to it for the life of your real estate career. If you want to find more targeted leads or to keep tabs on your competition, LinkedIn is a goldmine. You can find groups for investors or new homeowners. Here is where you can become a sort of authority voice on real estate. This builds up your reputation and real estate brand, which increases the likelihood that you'll get a positive response when you pitch prospects. You can also use LinkedIn as a platform to amplify your real estate blog, cross-post articles, and share helpful guides. People don't expect helpful pro-bono real estate consultations, so this is a great way to generate organic leads. FSBO listings are always ripe for a realtor's touch. The success rates for FSBO listings are incredibly low, so it wouldn't take much to demonstrate the value of having a real estate agent's help. Give them a history of your success and compare it with how long it takes to sell as an FSBO and the average mark for asking price. You can live on a steady diet of FSBO listings, provided to you by us. Disgruntled sellers who weren't able to get their property sold in time are another prime lead generation real estate listing. You can swoop in and be their knight in shining armor, so to speak. We're not talking about being phony to get the business of desperate customers, though. Show them that realtors are on their side and that you can show them what went wrong and how you can help them reach buyers. There's never a shortage of expired listings in real estate, especially with expired leads from Landvoice. We mentioned working on a real estate website and blog to build your brand, but what you can't neglect is SEO. Search Engine Optimization is all about optimizing your digital profile to appear at the top of local search listings. It's hard to be the best realtor in the state when you only have mentions of your location in your contact info. The key is weaving in the most-searched phrases into your website content and blog posts. If there's a lot of people looking for homes in your territory, you need to make sure they find your web pages. Improving SEO is something you should probably leave to a marketing team, as there are rules and penalties for doing it wrong, too. Last, but not least, you should already have a decent social media presence. If not, then you can move this tip higher in our ranking of importance. Social media is where you will promote your brand and, potentially, generate the bulk of your organic realtor leads. You have to balance your social media posts between being natural, approachable, knowledgeable, and professional. Too much of anything can make your accounts appear boring, spammy, or untrustworthy. This is also something you could hand off to an experienced marketing team. A lot of time can be occupied with growing your social media following if you DIY. Those are our top eight real estate lead generation ideas! Hopefully, some of these will help you open up new opportunities. There are many other tools out there, of course. Services that can help you capture unlisted clients, search more neighborhoods, and stay ahead of the curve. If you're interested in hearing more about these opportunities to generate more real estate leads, feel free to contact us. We can offer free advice and more information on how these services work.